The world has witnessed the cross-carpeting of African athletes from their home countries to others from time past till date, and Nigeria seems to have a high statistic in this regard. The rate at which the continent’s most populous nation is losing her world class athletes to other countries, especially the oil rich ones in Asia, is alarming and should be a matter of concern for all sport loving Nigerians. 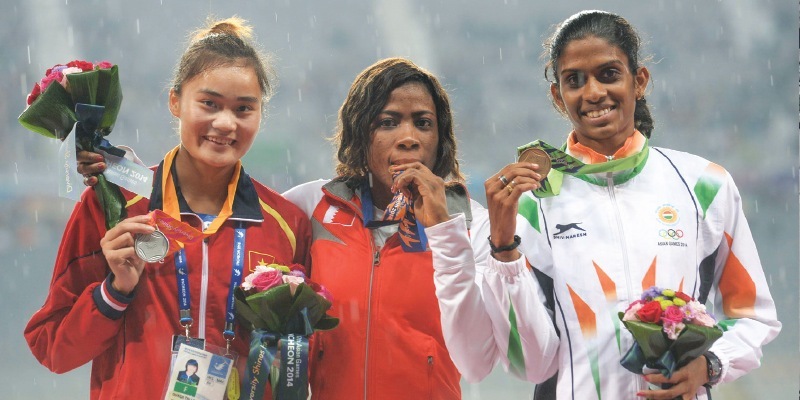 In the first two days alone of the recently concluded 17th Asian Games in South Korea, African-born athletes bagged five gold medals in seven races. 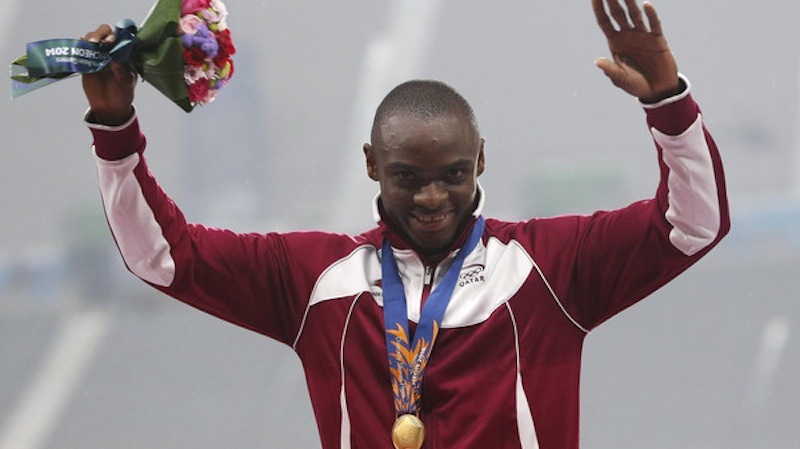 Two of such medallists were Nigerian born Femi Ogunode of Qatar and recently naturalized Kemi Adekoya of Bahrain. 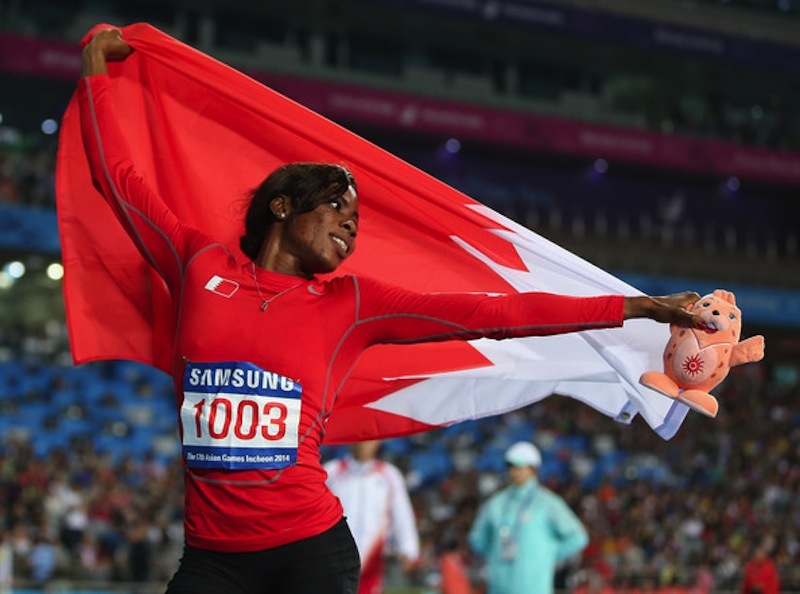 Ogunode went on to become double Asian Games record holder in both the 100m and 200m (9.93s & 20.14s), while Adekoya claimed a 400m and 400m Hurdles double (51.59s & 55.77s) – she also ran Asian Games records in the heats of both races (51.11s & 55.09s), meaning that both she and Ogunode have run faster than any Nigerian athletes in their respective disciplines this season, American recruits included! 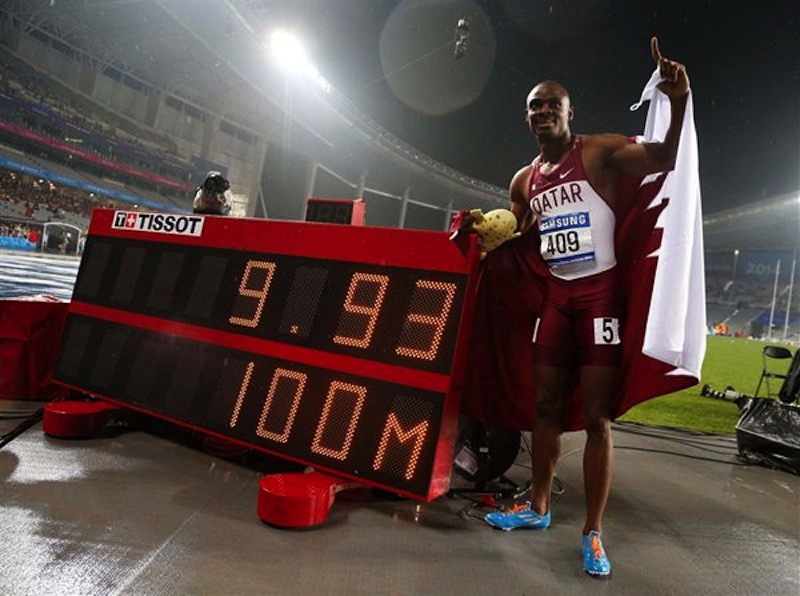 Interestingly, Ogunode became the second “Asian” in history to break the 10s mark in the 100m after Samuel Francis, also a Nigerian-born Qatari, first did it seven years ago in 9.99s. Francis was a finalist in the race but finished 8th after he looked to be suffering from a leg injury. 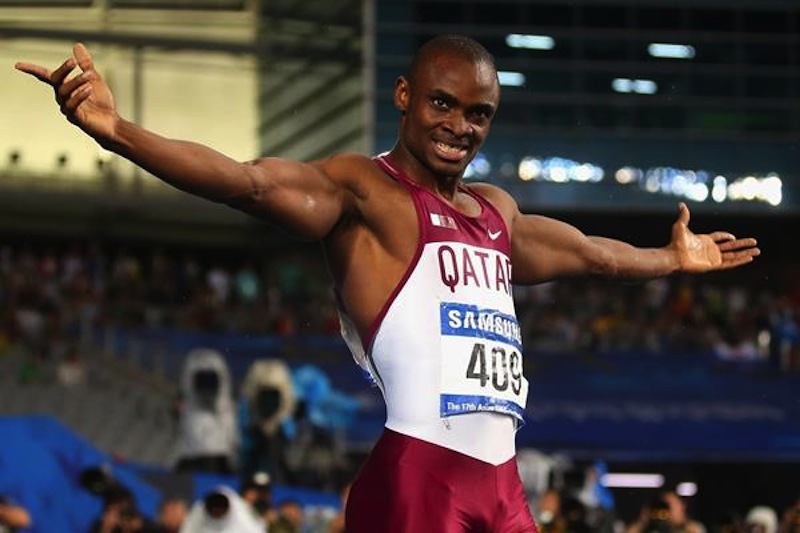 Ogunode was born in Nigeria but acquired Qatari nationality in 2009, and promptly won a 200m/400m double at the 2010 Asian Games (20.43s & 45.12s). 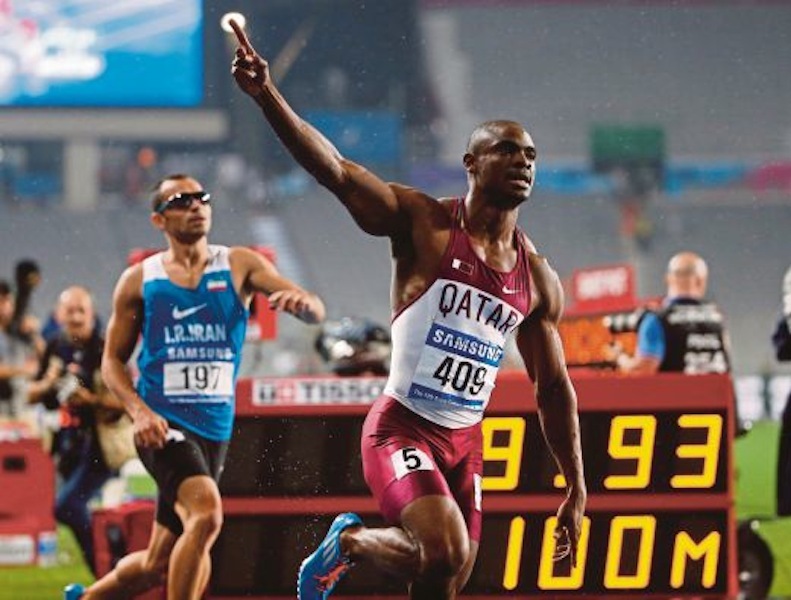 After serving a two-year ban for doping, he returned to competition in January 2014 and he kicked off the season well with a 60m World Indoor Championship bronze medal in March. He then ran a wind-assisted 20.06s in Bulgaria, before coming 3rd twice for Team Asia-Pacific in the 100m and 200m event at the IAAF Continental Cup in Marrakech. 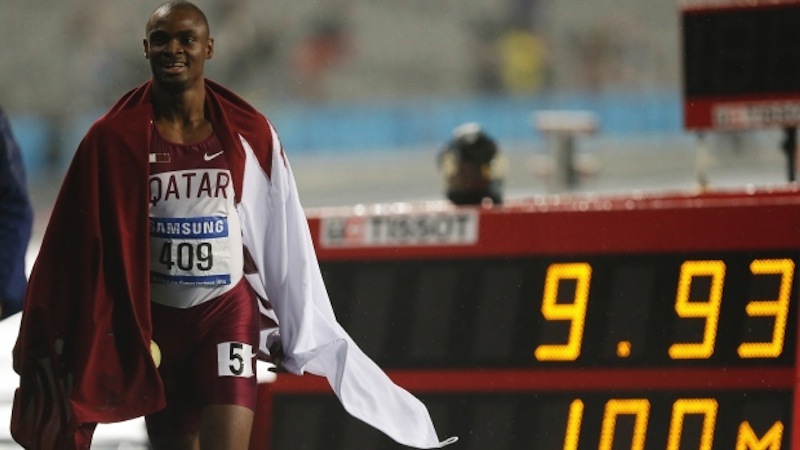 Qatar’s Femi Ogunode after winning the 100m at the 2014 Asian Games in 9.93s. 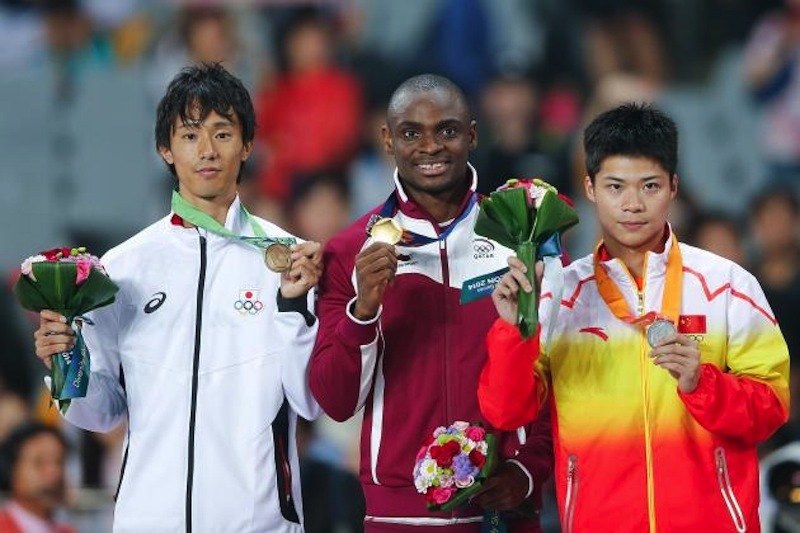 China’s Su Bingtian Bronze and Japan’s Kei Takase took Silver and Bronze respectively. 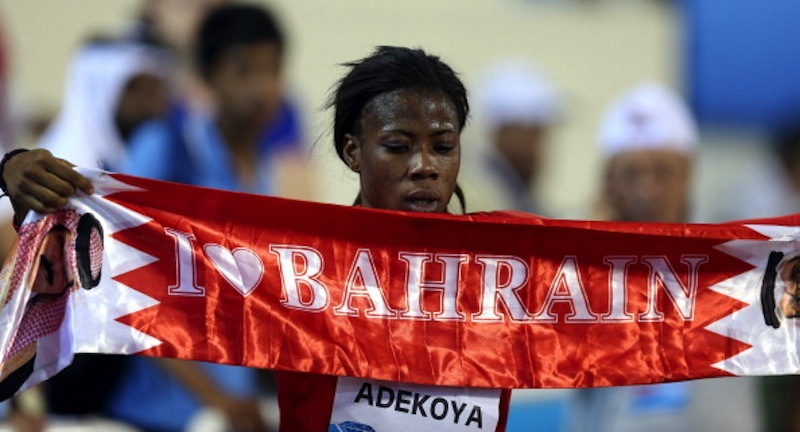 Adekoya just began competing for Bahrain in 2014, after years of impressive, yet seemingly unheralded progression in Nigeria. She established herself as a hurdler at national level in Nigeria in 2011, placing 5th at the Nigerian Championships. In 2012, she was runner-up at the Nigerian Olympic trials, and repeated the feat at the 2013 World Championship trials, setting a new PB of 55.30s (putting her in the world’s top 30), and finishing runner-up in both years to Ajoke Odumosu, Nigeria’s leading hurdler. In 2014, she marked her debut in the Diamond League circuit by defeating the entire elite 400m hurdles field in a surprise win and world lead of 54.59s, setting a new National Record (NR), this time, not for Nigeria, but her newly adopted country, Bahrain. Her rise to prominence has been impressive, and one must wonder if Nigeria could not have done more to keep one of the nation’s brightest young athletes. Surely if the funds being showered on the likes of Nigeria’s recently naturalized Americans were showered on the likes of Adekoya, she could not possibly have been seduced by Middle Eastern oil dollars? While there is a common misconception that these athletes have ‘betrayed’ their fatherland, the question that we really ought to ask ourselves as a nation is, WHY DID WE LET THEM GO? 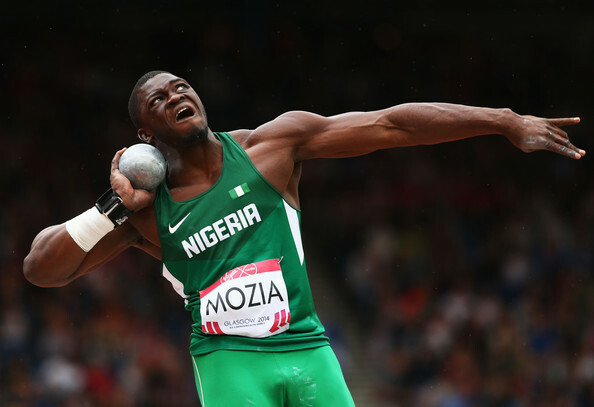 These athletes have not donned the colors of other nations out of un-patriotism – they have done so seeking to make a living from the sport they love, a living that they could not possibly make under the current conditions of the sport in Nigeria. Tune in next week for Part II of this tragic tale of Nigeria’s “Brawn Drain” – why are we letting our best talents switch to other countries in the prime of their careers? It was a wet but happy morning for Kaduna state born Emmanuel Gyang at the 2014 Lagos Beach Marathon as he easily defended his title when he crossed the finish line in the 10km race ahead of eighty-five other athletes in a time of 38 minutes. Speaking to Making of Champions (MoC) before his race, Gyang said his aim was to defend his title and improve on his time from last year, knowing there would be stiffer competition this year with the bar of the competition being raised. Gyang, who came alongside his elder brother and training partner, Danjuma, added that he would be much happier if they both got to win something at the competition. The race started at 10am, 2 hours behind schedule, perhaps as a result of a heavy downpour of rain. The Special Guest of Honour, the Eti-Osa Local Government Chairman, Honourable Olanrewaju Elegushi flagged off the event by starting the race with the athletes, but pulling out 20 seconds into the race, jokingly saying the athletes didn’t wait for him. The president and organizer of the event, Barrister Philips Ogbuesi stated that this year’s edition had been challenging because most people and organizations would not sponsor or partner with them due to their belief that most organisers of such events in Nigeria often fail to put up a show to match the standards promised. He added that the economic situation of the country has not helped matters. On the low turn-out of participants at an event where over 400 participants were expected, Barrister Ogbuesi said the rain may have been a major factor. He also added that the number of officials had increased from twenty-five last year to thirty-eight this year, most of whom were from the Lagos State Amateur Athletics Association (AAA). There was some drama in the female category, as the winner, Olamide Oluwaseun was disqualified for bridging the rules (allegedly running outside of the agreed course) – she misses out on her first win, after coming third in the two previous editions. 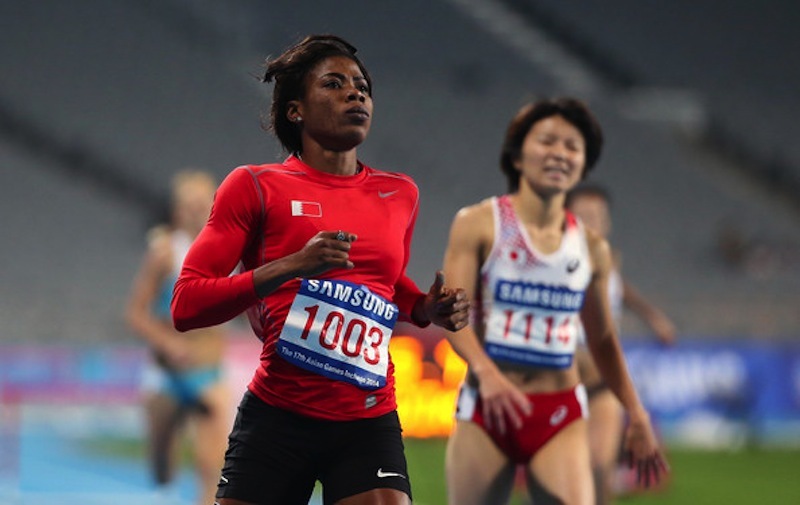 Her disqualification meant the first runner-up Muibat Ogunkoya, a cousin to former Nigerian 400m queen, Falilat Ogunkoya, became the winner while third placed Olumudi Aderonke, was promoted to the second position. Still panting after her race, Aderonke said she was very happy to have won something from the race, because this was her first time of competing at a beach marathon race. “I have come third twice and second once at the Obudu mountain race. I also represented the country last year in China at a half-marathon where I won the 10km.” She also has competed in the 10,000m at the 2012 National Sports Festival, where she came 10th representing Delta State. Other sport icons present at the event were Nigeria’s first female National Coach Amelia Edet (retired), Technical Director of Lagos State Amateur Athletics Association (AAA), Mr. Tony Osheku, Nigeria’s former (2013) 400m champion, Noah Akwu, and some members of the AAA. Dancers, musicians and comedians were also there to entertain the guests and athletes after the race. In this third edition of the event, the prize money listed for the winner was raised from ₦75,000 last year to ₦100,000, while the first and second runners-up are to pocket ₦50,000 and ₦25,000 respectively. The Lagos International Beach Marathon is used to mark Nigeria’s yearly independence as a country and also create awareness on the scourge of cervical cancer amongst Nigerian women. Another objective of the race is to provide a new platform for sports, recreation, tourism and charity as a vehicle for peace building. The event was organized by the Community Agenda for Peace in collaboration with the Combat Cervical Cancer. 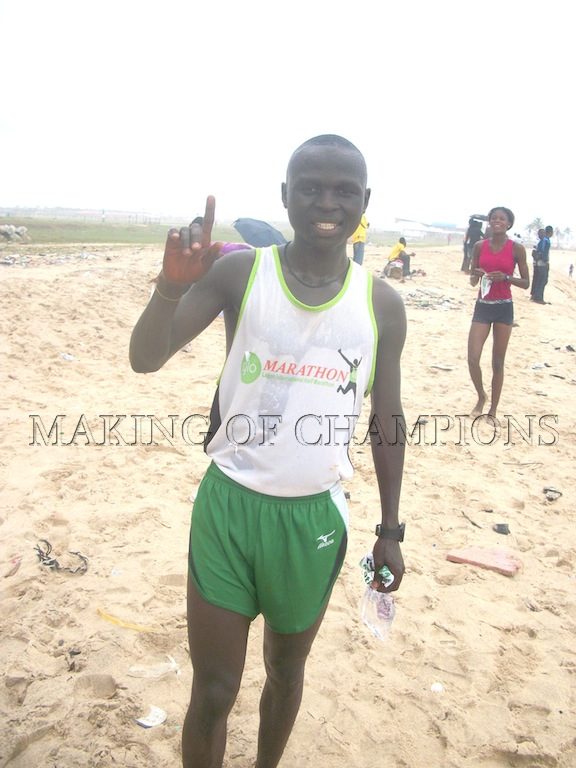 Emmanuel Gyang, 2014 Lagos Int’l Beach Marathon Champion successfully defends his 2013 title! 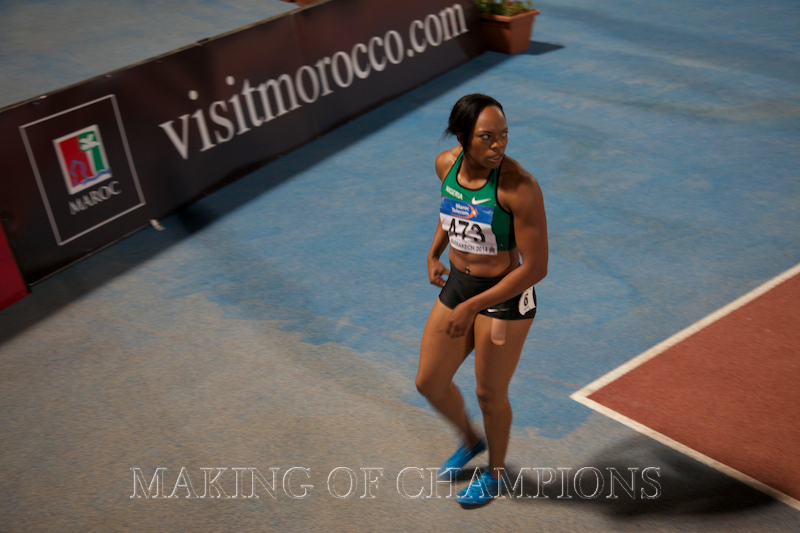 Team Nigeria dominated the women’s 4x100m at the African Championships in Marrakech last month after Blessing Okagbare led the team to a fourth consecutive title in 43.56s, ahead of Cote d’Ivoire (43.99s) and Ghana (44.06s). However it is a mixed grill that will make an appearance at the forthcoming IAAF Continental Cup, comprising of two Nigerians, an Ivoirian and a South African. Nigeria’s Gloria Asumnu (No.36 with 11.15s) and Dominique Duncan would be in action for Team Africa in what has been an eventful season. The pair picked silver at the Commonwealth Games in Glasgow with the 4x100m team, and then struck gold in Marrakech last month. They will be joined by African Championship Silver Medallist in the 100m, 200m and 4x100m, Marie J Ta Lou Gonezie (No. 43 with 11.20s) of Cote d’Ivoire and South Africa’s Justine Palframan. Unfortunately, the absence of the continent’s top two athletes, Blessing Okagbare (No. 2 with 10.85s) and Murielle Ahouré (No. 6 with 10.97s) at the Continental Cup will be sorely felt by friends and foes alike, as their presence would have raised the bar in terms of the level of competition, and bridged the gap between the hosts and their opponents. The star-studded Americas team will be led by world No. 2 (held jointly with Okagbare), Michelle Lee-Ahye of Trinidad and Tobago (10.85s) and has Diamond League trophy winner and Commonwealth silver medallist, Veronica Campbell-Brown (No. 4 with 10.86s), Tianna Bartoletta (No. 5 with 10.92s), Samantha Henry-Robinson (No. 7 with 11.00s) and Joanna Atkins (No. 11 with 11.02s) in tow. They would no doubt be the side to watch out for at the event. Asian champions Japan occupy the 33rd spot on the world rankings with 43.74s and Yuki Jimbo, Yuki Miyazawa, Mizuki Nakamura, Maho Takamori and Tomoka Tsuchihashi make up the Asian-Pacific team. The IAAF Continental Cup will be taking place in Marrakech, Morocco THIS WEEKEND (Sept 13th & 14th), and Gloria Asumnu (NGR), Dominique Duncan (NGR), Marie J Ta Lou Gonezie (CIV) and Justine Palframan (RSA) will be representing Team Africa in the women’s 4x100m on Saturday Sept 13th at 9.40pm! Dominique Duncan goes head-to-head with Schippers, Soumaré in 200m @ Continental Cup! Team Nigeria’s Dominique Duncan is set to take her place amongst some of the world’s best athletes in the women’s 200m as the IAAF Continental Cup takes off in Morocco this weekend. 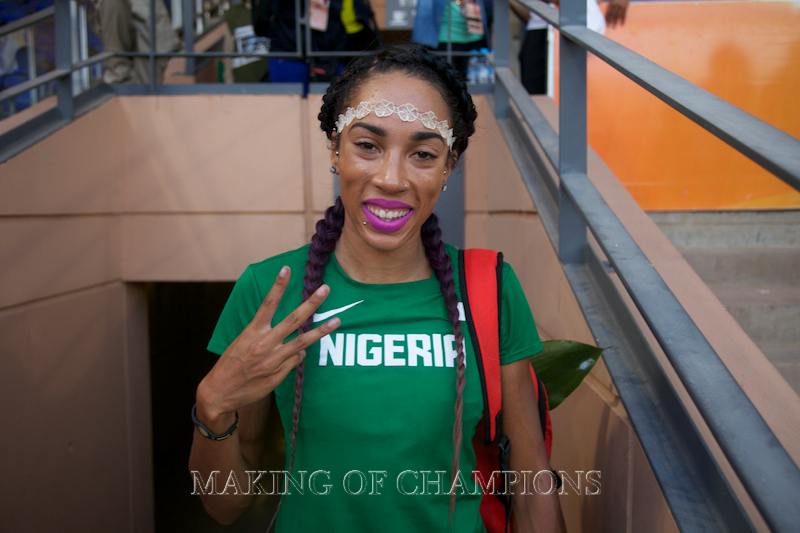 Duncan first donned the green and white colours this year, having switched allegiance from the USA, and she placed third at the National Trials with a time of 23.91s, behind Blessing Okagbare (22.62s) and Gloria Asumnu (23.54s). Her first outing for Nigeria was at the Commonwealth Games in Glasgow where she competed in the 200m and 4x100m relay. 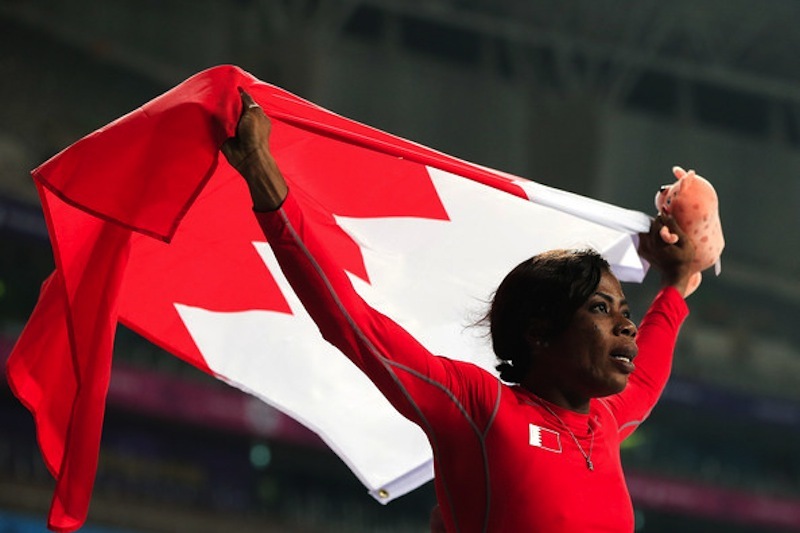 She missed out on an appearance in the final of the 200m but took silver in the relay with the team, which finished behind Jamaica in the final with a time of 42.92s. She was at the African Championships in Marrakech a week later, where she claimed her first continental title in the relays, then comfortably led her heat in the 200m. She finished second behind Cote d’Ivoire’s Marie J Ta Lou in the semis, clocking 23.44s, and qualified for the final alongside team mates, defending champion, Gloria Asumnu and Regina George. 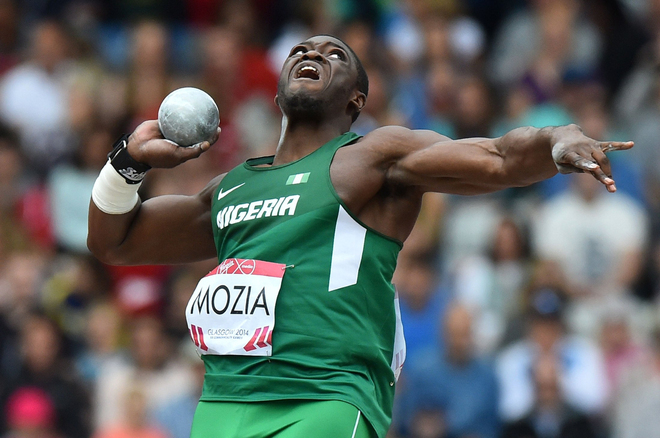 The race was a battle for superiority between Nigeria and Cote d’Ivoire’s duo of Ta Lou and double silver medallist at the 2013 World Championships, Murielle Ahouré. However it turned out to be 1-2 for the Ivoirians, with Ahouré taking the win in 22.36s, while Duncan was the surprise medallist from the Nigerian camp, winning bronze in 22.98s. Asumnu and George placed fifth and sixth respectively. She is ranked No. 31 in the world with a Season’s Best (SB) of 22.82s, while teammate, Ta Lou, incidentally, is five places lower with 22.87s. World No. 2 and European double sprint champion, Dafne Schippers (22.03s) of the Netherlands is the standout athlete to watch out for, along with Myriam Soumaré (No. 3) who posted a scorching Personal Best (PB) of 22.11s at the final leg of the IAAF Diamond League in Brussels. Joanna Atkins (No. 7 with 22.27s) and Team Americas partner, Anthonique Strachan (No. 12 with 22.50s) are also key contenders in the race. Their Asian-Pacific rivals comprise of Olga Safronova, (No. 34) with 22.85s, while Melissa Breen is further down at the 158th spot (23.37s). The IAAF Continental Cup will be taking place in Marrakech, Morocco THIS WEEKEND (Sept 13th & 14th), and Dominique Duncan will be representing Team Africa in the women’s 200m on Sunday Sept 14th at 7.35pm!